Sourced from sustainable fir, this Wall Hugger planter by VegTrug has been designed for ease and comfort of use. It stands at a comfortable working height and helps to relieve those gardening-related aches and pains! With a purpose built, fitted membrane which ensures proper ventilation and drainage, this planter is ideal for looking after your seedlings. 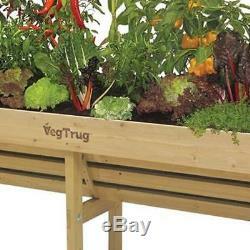 As a part of the VegTrug range, this wall hugger can be easily netted or covered depending on the season and the removable membrane can be removed and replaced so you can re-use this planter for year and years to come. Comfortable Positioned at the ideal working height, this Wall Hugger is gentle on your back. Sustainable The fir used to make this VegTrug came from a fully sustainable source. Compact This planter is ideal for narrow spaces so you can grow a garden on your balcony! Made from 100% FSC fir. Delivered flat packed in one box. H80 x W183 x D46cm. We go above and beyond to ensure you receive the best level of service. 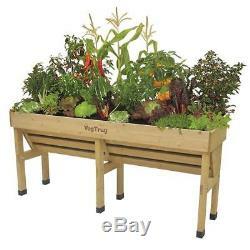 The item "Large Raised Planter Vegtrug Wall Hugger Stand Winter Balcony Garden Veg Bed" is in sale since Tuesday, April 10, 2018. This item is in the category "Garden & Patio\Plant Care, Soil & Accessories\Baskets, Pots & Window Boxes". The seller is "king_alexander_uk" and is located in London. This item can be shipped to United Kingdom, Antigua and barbuda, Austria, Belgium, Bulgaria, Croatia, Cyprus, Czech republic, Denmark, Estonia, Finland, France, Germany, Greece, Hungary, Ireland, Italy, Latvia, Lithuania, Luxembourg, Malta, Netherlands, Poland, Portugal, Romania, Slovakia, Slovenia, Spain, Sweden, Australia, United States, Russian federation, Canada, Brazil, Japan, China, Israel, Hong Kong, Norway, Indonesia, Malaysia, Mexico, Singapore, South Korea, Switzerland, Taiwan, Thailand, Bangladesh, Belize, Bermuda, Bolivia, Barbados, Brunei darussalam, Cayman islands, Dominica, Ecuador, Egypt, Guernsey, Gibraltar, Guadeloupe, Grenada, French guiana, Iceland, Jersey, Jordan, Cambodia, Saint kitts and nevis, Saint lucia, Liechtenstein, Sri lanka, Macao, Monaco, Maldives, Montserrat, Martinique, Nicaragua, Oman, Pakistan, Peru, Paraguay, Reunion, Turks and caicos islands, Aruba, Chile.